In considering the design of your dining room, you concentrate on the furniture. The norm is for the chairs to be the same in material and color to the chairs. But modern interior designers had conceptualized to mix and match dining chairs that are far from the look of the dining table. Maybe, you cannot imagine how the dining area will be. The basic suggested mix and match dining chairs concept is having them identical in design except for their colors. Or you can have different designs but their colors are identical. You can have your choice. If you cannot imagine how the eating area will look like with either of these two designs, you can always refer to current trends in interior designs. Looking at the identical designs, you can have a choice of the same materials. Wood or wrought iron, the frames are all the same in shape, height and appearance. Have them painted in different colors. The other option is to have all the frames in the same color and the difference will be in the color of the upholstery. Now, you can choose a motif color and have different chair designs and sizes but of the same chosen color motif. When you mix and match dining chairs with different colors, ensure that your choice of colors are complementary; you can also go monochromatic. 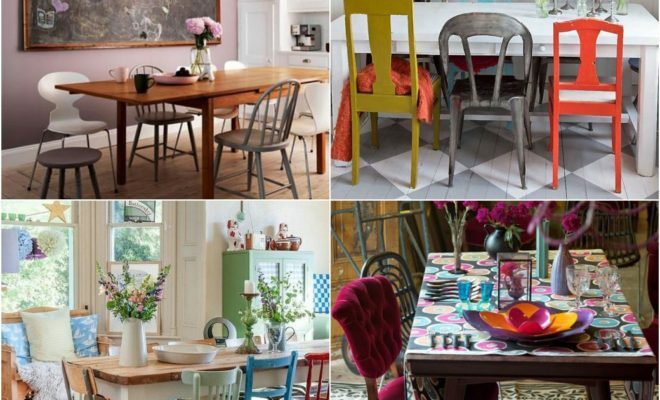 You can go more offbeat in the mix and match dining chairs idea by choosing entirely different kinds of chairs surrounding an entirely inconsistent dining table. Take for instance a glass table that is surrounded by chairs made of wood, wrought iron and plastic. And these chairs are all different in colors and shapes. It is not only the chairs that are varied but even the table has nothing in common with any of the chairs. However, as a whole the set looks good. It is how you set them up in your dining area. Again, try to take a look at new trends and see what kinds of chairs can be mixed and matched.